Creating my very own personal style is important to me. It's something I think about quite often. I'd like it if a friend saw something and thought, "That is so Michelle." I'm also concerned with identity; I feel like I know myself well. The thing is I'm rather shy and quiet... I've never been all that great at expressing who I am out loud, having enough confidence to do so. Dressing and accessorizing is a fun way I can. When I dress up, or even dress in my go-to uniform for hanging out around the house of dark blue jeans, a plain white cami, a lightweight black hoodie with the sleeves pushed up, ballet flats and big earrings, I feel good. I'm completely me. I love words like classic, perfect, ultimate and quintessential. The best and most personal version of a timeless staple. Something you can depend on. Preferring a more classic look, I don't really follow trends. I think it's such a shame that most people wear so many of them. For example, jeggings don't look good on every body type. People could do so much better... Fit is key. As well as proportion and highlighting your assets. Shouldn't style be much more personal than simply mainstream? I like to think I dress in a way that flatters my body type, which just so happens to be hourglass. Which means a fitted v-neck shirt that ends at the hip on the top and either an a-line skirt that hits at the knee, a wide-leg trouser, or my favorite, a pair of dark boot-cut jeans on the bottom. 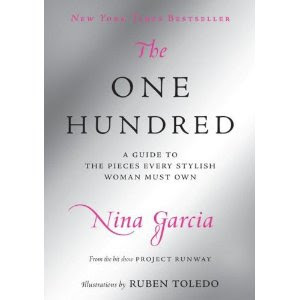 I adore the book "The One Hundred: A Guide to the Pieces Every Stylish Woman Must Own" by Nina Garcia. She's one of the judges on the TV show Project Runway. I have yet to see an episode but every time I say this to someone, they reply that I'd love it. Haven't had a chance to read her other books on the subject of style either! They are: The Little Black Book of Style, The Style Strategy: A Less-Is-More Approach to Staying Chic and Shopping Smart, and the recently released Nina Garcia's Look Book: What to Wear for Every Occasion. Anyway, "The One Hundred" is an outline of the timeless basics of a stylish woman's wardrobe. Nina wants to feel classic as well, a kindred spirit. This is very much her list, a fact she totally admits. She encourages readers to make their own list and adapt each and every item on it to their style. I do admire her style. And have even added things on her list to my closet. Because of this book, I had to have bangles again, my first L.L. Bean tote, perfume (never wanted it before but now I wear my signature scent, Chanel No. 5 Eau Premiere, every single day), a plain white t-shirt, a safari jacket, a striped sailor shirt, and turquoise earrings. I happened to purchase my first wrap dress a few weeks ago but that's a classic I've wanted for awhile. I don't like every item on this amazing list however, like... the boyfriend cardigan or a cape. She also offers that nail polish should only be red red, faint pink, black or clear. I don't mind a red or clear nail but my favorites are shimmery dark pinks. My ultimate favorite of that particular range is "It's All Greek to Me" by OPI. I love color... Why so limited, Nina? Much as I love finding inspiration and basically knowing what's in, I don't feel the need to buy fashion magazines so much after purchasing this book. Those magazines could potentially be an expensive habit. I'll save money to buy items on my personal style one hundred. ...hmm... only 59 things. Maybe I'm not quite finished... And maybe I'll explain my choices on a more complete list in a future Style Sunday. It might not be 100 though... I do like to keep things simple and only keep things in my closet that I adore and look fabulous on me. ...it's very much on the small side. What's would definitely be on your list?